You survived Monday, give yourself a pat on the back! Today's post is a quick post of my current nails. Jelly polish + dots sandwiched in between = a DOTWICH!! I basically started with a base coat, then dots, then jelly polish, and repeating until I got my desired looked, ending with dots! I kinda like how this turned out and I love the fact that the color combo possibilities are endless. I used Loreal Bananarama Love and Ruby Kisses Tropical Green for this look. I will definitely be playing with other color combos in the near future. 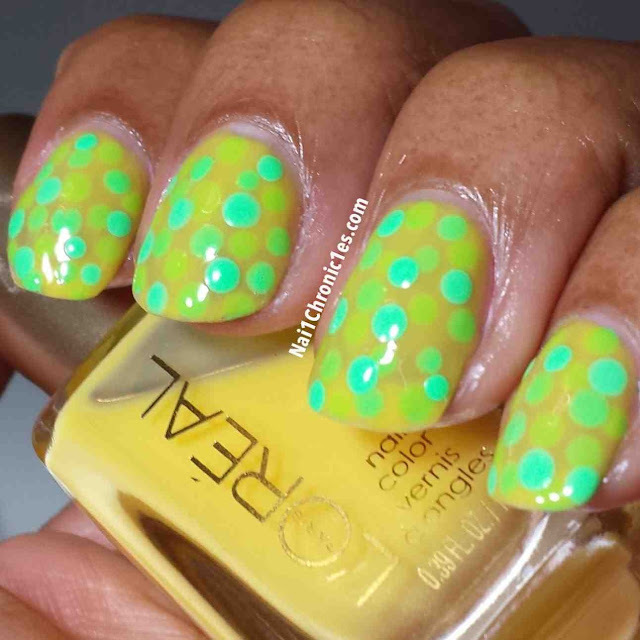 So what do you think of dots vs glitter sandwiched between jelly? Which do you prefer? Let me go peruse and see what else I want to try and attempt to recreate! That's a fun look! Sort of Halloweenish!